I love wallpaper but I'm too chicken to commit an entire bedroom to it. I do like the idea of using it as an accent to add color and pattern. I couldn't help but smile when I saw Alicia Paulson's of Posy Get Cozy closet door. 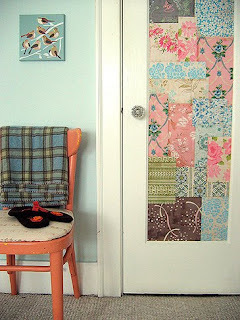 The patchwork of vintage wallpaper is so cheerful, and the project was easy. Her blog has all the instructions. 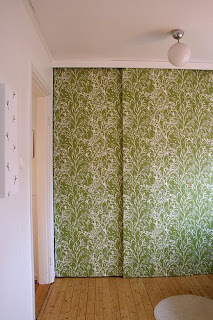 I love the modern wallpaper Benita at Chez Larsson installed on her closet doors. The pattern reads more like texture and really pops against her white walls. I consider myselft crafty, but not artistic, so I'd have to hire someone to paint a mural on my doors, but it might be an investment. 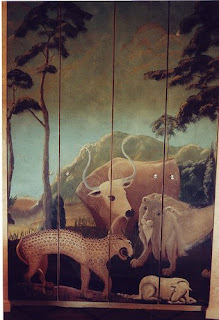 Jim Griffith's murals look like old world art. 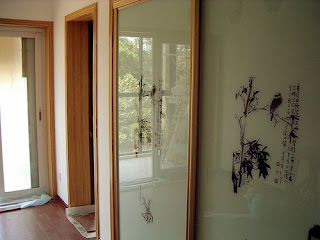 Apparently, you can buy closet doors already adorned with beautiful brushwork in China. Why can't we have this at our local Home Depot?